OneDrive for Business gives you the ability to share files with others quickly and easily. You can even share files with others so that anyone can view them without needing a login. This is known as anonymous sharing. which you need to access as a global administrator. Next, select the file you want to share in OneDrive and then select Copy link from the menu across the top. Set the desired permissions. I’d generally recommend you set these to read only. If you now plug that into another browser or an ‘in-private’ browser session the file contents should be display as shown above. If the document doesn’t appear or you are prompted to login then you need to double check your document sharing. However, let’s now say you want to embed this document into a public web page. You should now see an embed dialog like that shown above. You will notice that the embed is also listed. However, if you copy and paste that code you end up with a web page like that shown above that asks for a login. From what I can determine the embed code provided is only for embedding inside something like a Team Site in Office 365. The embed code is not for use with anonymous external users. That is, it won’t work for public viewing on the Internet. So the trick when it comes to embedding anonymous document from OneDrive for Business is to change the embed code to include the URL of the external sharing link you received when you shared the file with everyone. Not as nice as other applications can embed anonymous documents, but then really, Office 365 isn’t really aimed at sharing information anonymously now is it? I’m also pretty sure Microsoft have this anonymous embedding feature on the roadmap but my guess is that it doesn’t have a high priority at this stage. I know there are a lot of Microsoft Small Business Servers (SBS) still out there in the wild. Unfortunately, they are becoming rather long in the tooth and harder to support and maintain. It’s aim is to show you the basics of connecting an SBS (or any legacy on premises) environment to the Microsoft cloud. The course will step you through the process of linking your existing on premises network to Azure via a site to site VPN. It will show you how to create Azure virtual networks and virtual machines. You’ll then see how to use these to easily extend your on premises environment. The course will show you how to set up Azure AD Connect to sync your on premises users to Azure and Office 365 while also taking advantage of Azure DNS. There is even a dash of PowerShell thrown in for good measure. Unfortunately, there is not a single button that will migrate your SBS environment to the cloud, however this course aims to give you a much better understanding of how to tackle that tasks as well the concrete steps you need to take when doing a migration. There are over 12 lessons with over 2 hours of interactive video training and resources. If you visit the course today you can access a free preview of the first lesson which is an overview. I will continue to improve the course material over time but I certainly hope that you’ll consider it if you are looking to moving SBS to the Microsoft cloud. If you navigate to a Team using the browser you can see and add additional tabs to an individual channel as shown above. Since the mobile Teams app launched it was not possible to view those additional tabs. The only option you could access was the Files tab. However, as you see above, with the latest iteration of the Teams app (on iOS and Android) there is now a Tabs option when you go into a Team. Once you do you will then see the Tabs as shown in the browser view. As with all Office 365 mobile apps, make sure that you update them regularly to take advantage of all the latest features. Another item to watch out for currently with Microsoft Teams is when you delete a channel and try and re-create it again with the same name. When you attempt this you get the error above. That seems to be the case even if you delete the channel prior, as shown above. A search reveals that a few people have experienced this and the reason seems to be basically that the deleted channel remains ‘somewhere’ in Office 365 for compliance reasons. There is also a Uservoice item that you can go and vote up to get this changed. It does say in there that Microsoft are planning to fix this issue but no other word as yet to when. The best solution is probably allow you to create a new channel with the same name but prompt to warn you that you are overwriting compliance information and then give you the option to continue with the overwrite or not. So, be careful when you delete a Microsoft Team’s channel as you can’t simply recreate it with the same name. A better option would appear to be to edit the Team and change what’s there. A very important part of any strategy is being able to measure the results of your adoption tactics. Microsoft has just made that measurement a whole lot easier with the release of the Power BI Adoption content pack for Office 365. Here’s how you enable it for your tenant. You’ll need to login to the Office 365 Admin center and locate the Service settings. The easiest way to do this is to use the Search functionality. You’ll then need to locate the Reports section as highlighted above. 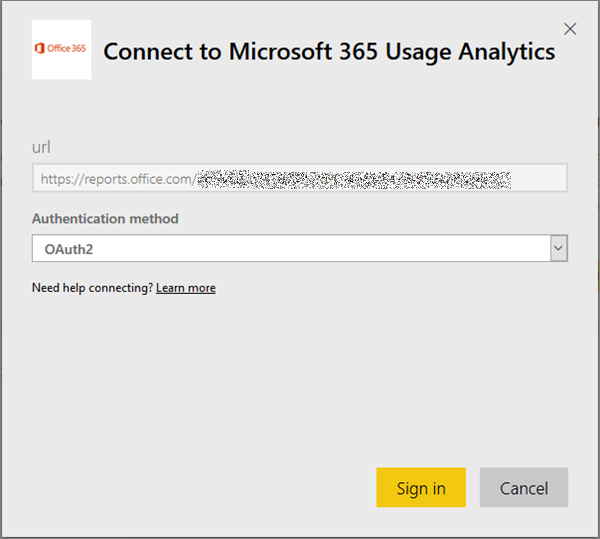 In here turn on the option to Make data available to Office 365 Adoption content pack for Power BI. This initiates the data collection. This may take between 2 and 48 hours depending on the size of the tenant. When the data collection has initialised you will find an additional tile in your Admin reporting area as shown above. The tile will contain your Tenant ID which you’ll need to record for the next stage. Next navigate to Power BI and select the Get Data option in the lower left of the screen. At the Get Data screen select Services. Locate the Office 365 Adoption Preview as shown above and select it. At the next screen, select the Get It Now button on the left. You’ll then need to Sign in. In a moment or two you should then be able to access the adoption dashboard as shown above. Now you have all the functionality of Power BI at your finger tips, directly linked to Office 365 usage data. This makes measuring Office 365 adoption much easier. The Office 365 content pack is still in preview at this point in time but will update going forward. The majority of my learnings end up in OneNote. As you would expect I have OneNote notebooks for just about everything including Office 365 and Azure. Having them in OneNote means they are searchable, available on every device and I can quickly add information no matter where I am. To my mind, they are pretty much the perfect as a portable personal knowledge base. I have now taken all my accumulated Azure and Office 365 knowledge and made them available as continually sync’ed OneNote notebooks for CIAOPS Patrons. That’s right, all you need to do to gain access to this material is sign up to be a CIAOPS Patron for which you’ll get access to both the Office 365 and Azure notebooks (plus I few more I’m planning on releasing) as well as access to my private Facebook community to discuss everything Microsoft cloud as well as a range of discounts (starting at 25%) to my online courses and publications. The great thing about these OneNote notebooks is that they are dynamic, in that I’ll continue to add information to them over time, posting all the stuff I’m already posted into the Facebook group, but organising it for people to locate quicker when they need to. Best of all, as long as you stay a CIAOPS Patron you’ll get access to this included for as little as US$10 per month. That’s a pretty small price to pay for the notebooks let alone everything else that comes along with being a CIAOPS Patron. Microsoft Flow is way to automate your business processes. It is way that you can connect to both cloud and on premises services and trigger actions and results. The above presentation is one that I recent provided to the SharePoint Users Group in Sydney that I re-recorded to make available publically.